Welcome to another Autism edition of The Cherry On Top. Every Monday we are looking across the Autism spectrum at various aspects. We are keeping it simple, to the point, informative and hopefully, helpful for everyone. We're mostly discussing things we've experienced because we are not professionals per say. However, we've got over 10 years dealing with the symptoms and behaviour of two boys at different levels of the spectrum. So, we've got a pretty good arsenal on how to live happier with Autism. 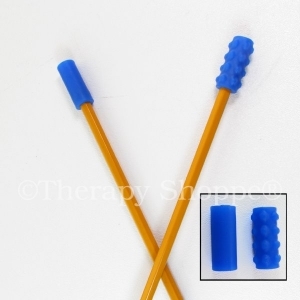 Last week we touched on oral fixations. Letting you know the signs of potentially harmful behaviour and what to do about it. We wanted to go a bit more in depth over pica because it's very serious and can cause illness and even death. Firstly, if you are dealing with pica, let me tell you, we understand! It may seem like quite strange behaviour to others and it may even be difficult to see or perhaps even be brushed off due to the incredulity alone. I really needed to get my head around it before I started being more active with the call of action. Pica is the consumption of non foods. In other words eating things that are not meant to be eaten. 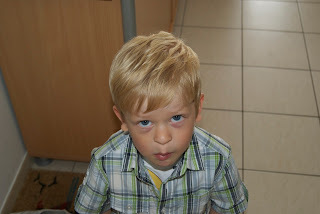 Our youngest had it bad when he was a toddler. Sand, rocks, spiders, insects, nuts, bolts, rusty screws (I know right?!) and especially and still things that are rubbery or squishy. We missed a lot of school because of illnesses attributed to pica and he ruined his teeth from chewing on rocks. Extreme vigilance is necessary. It could save a life. We often had to save our child from choking. Make sure you learn how to do this if you also know someone with pica. Tip: What helped us the most was explaining each and every time that you may not eat things that are not food. Like I said, JJ was a toddler when it started and he was also 100% non verbal. We spoke clearly, without anger, attempted eye contact, nicely held his hand or shoulder and with as less words as possible told him that this was dangerous. Don't expect confirmation from the child. Especially, if they are non verbal, but continue to speak with them even if you think they are not listening. It's equally as important to alert family, friends and caregivers or teachers about this condition. It is unclear what causes pica. A dietary inefficiency perhaps. I would assume that the pica JJ experiences is because of the developmental disabilities attributed to his Autism. It may also have something to do with wanting to know what something tastes like and feels like in the mouth. That might sound strange to you and me. 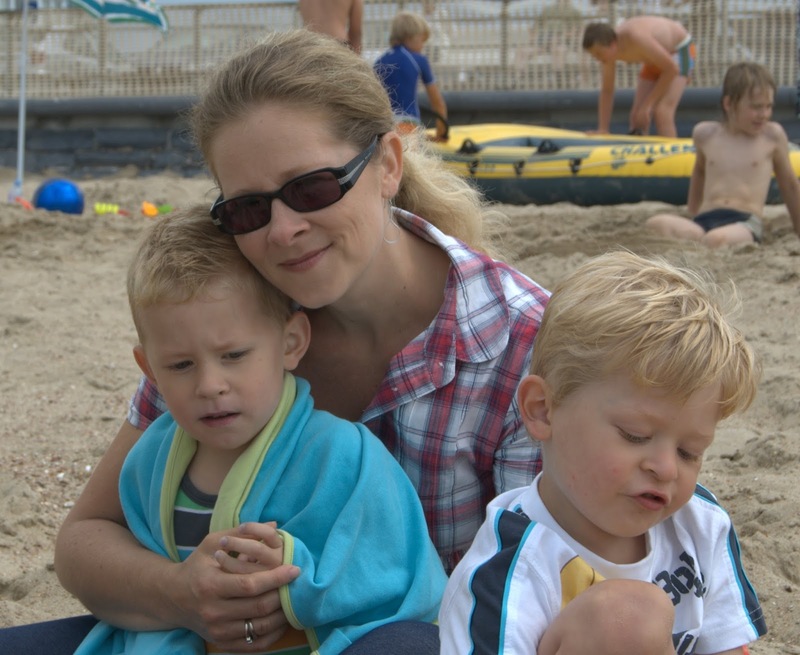 However, through our time with JJ we see that Autistic folks look at things a lot differently, on completely different levels and with an entirely different background experience. If you are experiencing pica, be patient, but diligent. Alert family, friends and caregivers about the condition. Make sure you know how to prevent and help someone who is choking. Learn the signs of poisoning and by all means, do not take any chances. You must constantly watch for potential consumption of non foods. Be sure to address this behaviour EVERY time you witness it. Vigilance and the constant reminder that this is not acceptable is necessary. It is dangerous. It is not healthy and could be deadly. These are what you must continuously remind the person of. Don't forget about the effectiveness of reverse positive reinforcement. Commend them for eating real food! It worked very well for us and JJ is so, so much better. Occasionally, I'll remind him of his previous behaviour. "Hey, JJ. Do you remember when you used to eat sand and spiders? You don't do that any more do you? Because you can get really sick from that! I'm glad you don't do that any more. You are so smart." It may sound silly, but I do occasionally see a piece of rubber or foam missing from various objects. Those are our tips for living with pica. I hope they were helpful and that you'll join us again next week when we look at tools to help pay attention in the class. 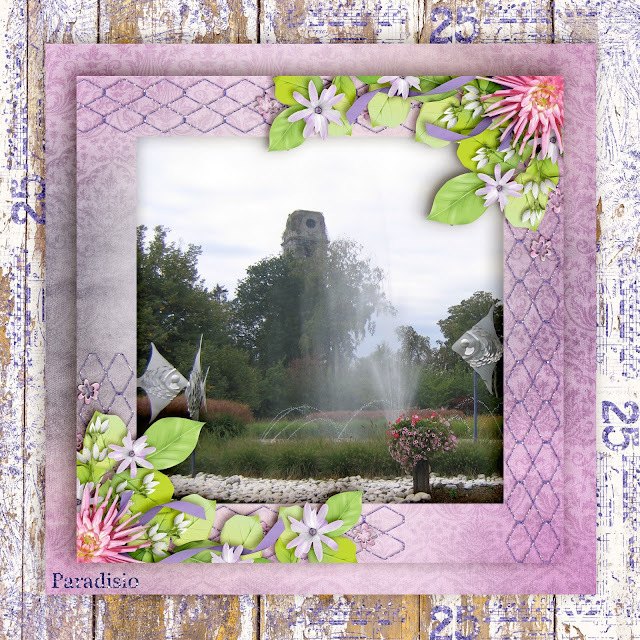 We are back with more scrap-a-licious inspiration from Throwing Some Scraps Around. 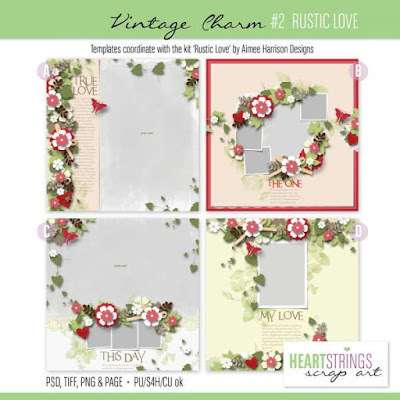 We got loads of layout love for you, some tips and..dun, dun dah...freebies of course. Yes, in the plural! Petrichor is Throwing Some Scraps Around, newest kit. These colours have such a soft natural feel to them. So I chose a photo with a lot of nature. Blue river, green trees on rolling hills along the Mosel River in Germany. My all time favourite place to be. This will be yet another edition for my Aunty's 70th birthday album. It's going to be a doozy! So is she! Hehehe...Rather than create dozens of new layouts just for her book, I use my own layouts and insert her photos. Saves hours! Want to get your hands on some fabulous freebies? Click on the image to find out how you can download these wonderful goodies. I want to show you another gorgeous kit from Throwing Some Scraps Around. It isn't new, but it's really fabulous. 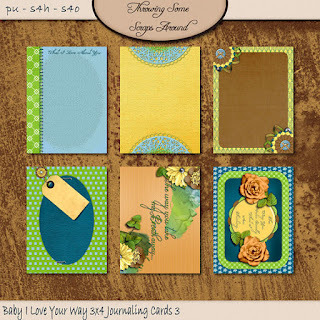 Baby I Love Your Way, is yet another fabulous kit from Jodi. I loved it so much, I made three layouts with it. 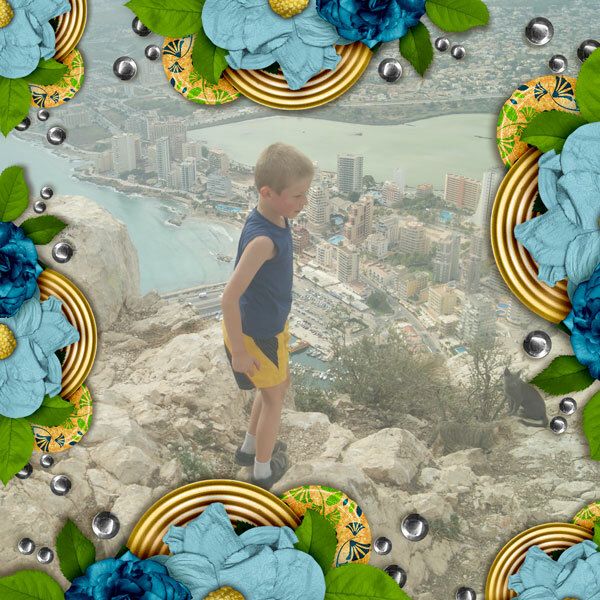 How about this view and this kid on top of the world or at least Calpe, Spain?! I am so glad I did not go on this trip! I would have been an absolute mess. These colours just go together beautifully. How fortunate that Jodi's kit matched my new dress so perfectly?! Find out here how I used the same cluster on these three layouts and scrapped incredibly fast yet beautifully. Jodi's packs for her kits are priced to sell. Most being just over $1! Treat yourself! Now, how about a freebie for being such awesome readers?! 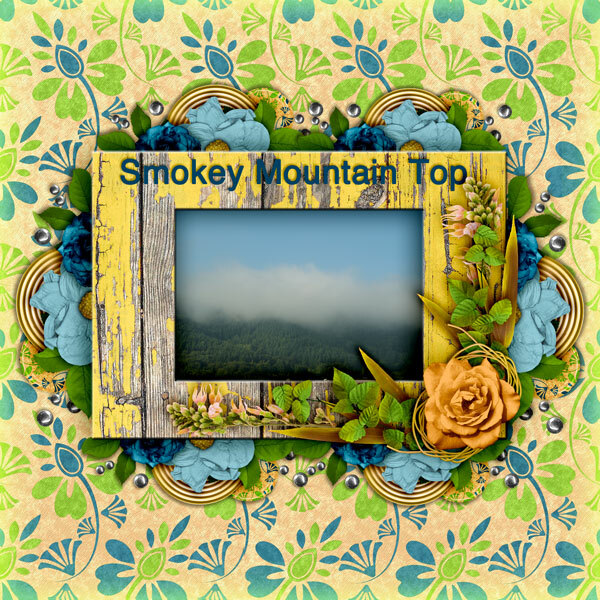 I'm using Jodi's filler cards and journal cards to design these sweet stacked elements. You should never feel like you have to stick with one kit. 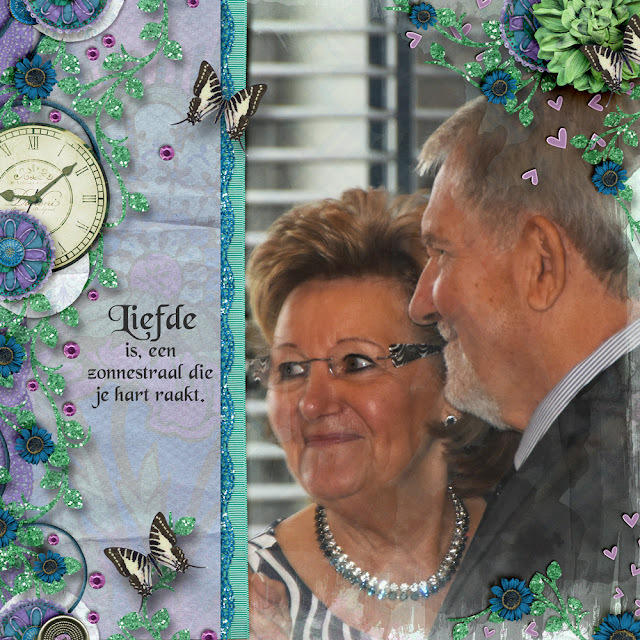 I used elements from several of Jodi's kits. Often I feel like a kit is missing something and rummage through my stash for that perfect fit. Right click to get the png download and enjoy! All of our goodies are for Personal Use ONLY. Do not resell them or claim them as your own, thanks. We've got a free hybrid for you, a free template and a tutorial on how to design a basic card template. 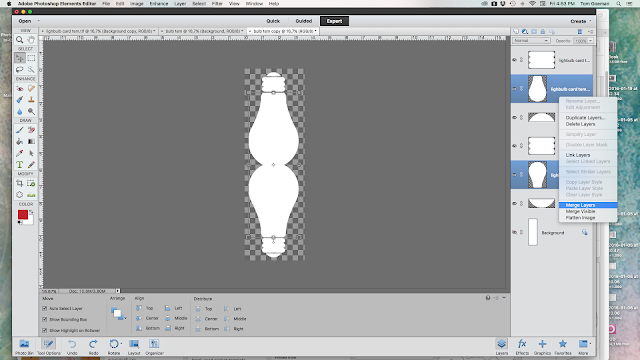 Using PSE11, I opened a new document, duplicated the background and used the cookie or shape cutter to form this light bulb. 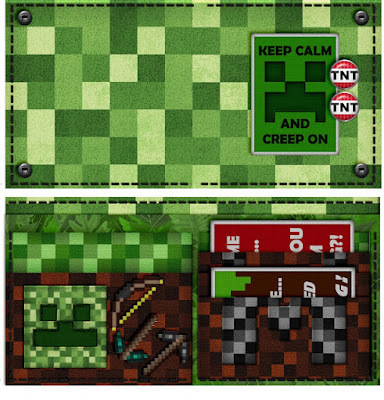 Keep scrolling to see the rest and get all of this fun free stuff! For any kind of card template or base if you will, all you need to do is copy and paste a basic shape or form. 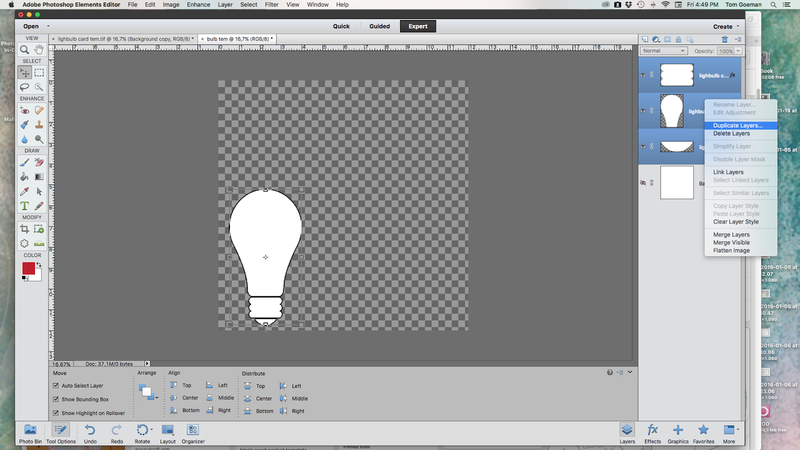 Here I designed this template lightbulb so that you could clip in all three different layers. You could also crop off or delete the second layers if you want to use just one light bulb as an element for another project. 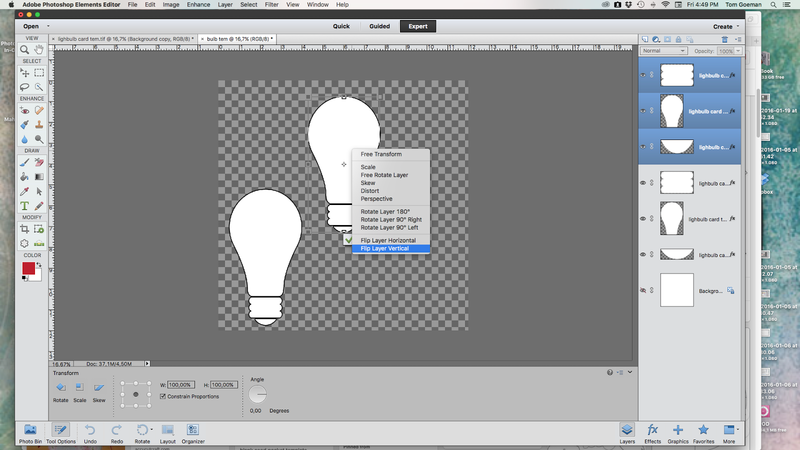 Look to my layers menu, on the right, select all of your layers you need to duplicate and copy. Now, you've got two light bulbs in 6 different pieces. You can see that these are both too big for my background. 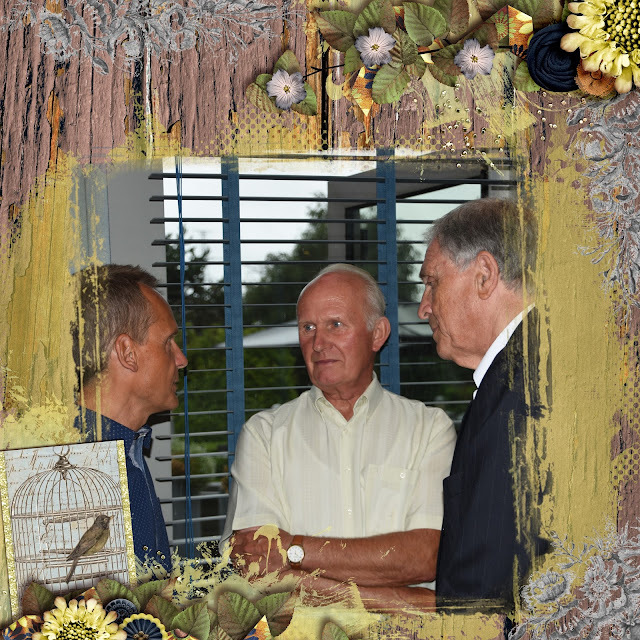 Click on all of the layers, except the background and shrink or enlarge to the size where they both fit on top of each other. As you see with the high lighted blue, field, you need to select all of the layers of your second image and flip the layer vertically. Now, you've got both light bulbs. Line them up. 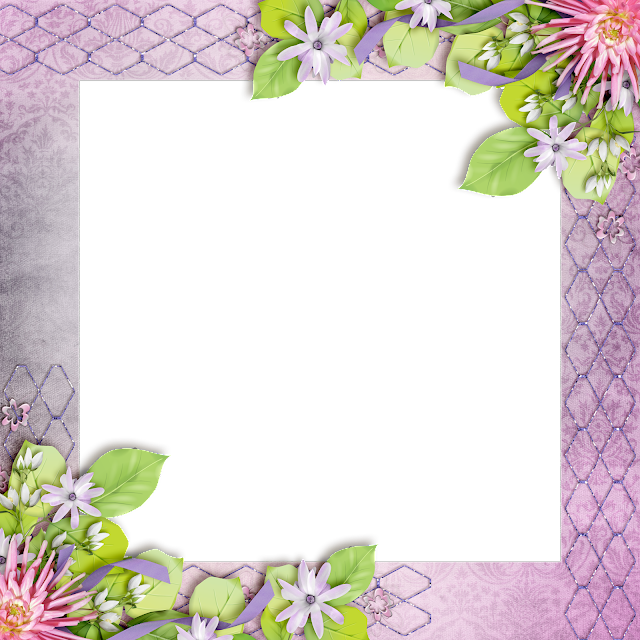 I overlapped quite a bit for this card template so that you will end up with a nice fold which will make your card more rigid. To get a super smooth finish, I suggest merging the layers when needed. Look at the high lighted, blue layers to see to what I am referring. Just the base has been merged. This way both bulb bases will be exactly the same. If you want them to be different, then don't merge the layers. Once the layers are neatly merged you can choose to outline your template with a border. The above image is a clearer example, but don't outline before you merge. I used a typical, cheap printer paper and I don't recommend this for your card. It would be fine for a tag. Because the base is smaller than the top, it's better to have a more rigid paper for this project even if just slightly. Delete the second layers for the second bulb and use just one bulb for a tag or any other project you may have in mind. I also cut off the black bottom because my card wasn't sitting with it, duh! I did want to leave it though so you could still use the bulb as en embellishment. Here's the actual card. It's on the small side. When folded in half it's just over 5 inches. If you have the option to print larger, then you may want to consider it. So, there you have it. 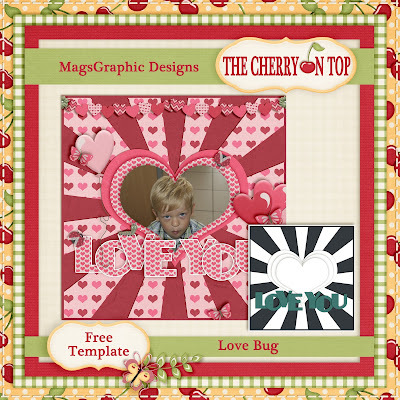 A cute card, a fun template to play with and the idea of how to make your own shaped cards. We've got a bird house template next week you won't want to miss. 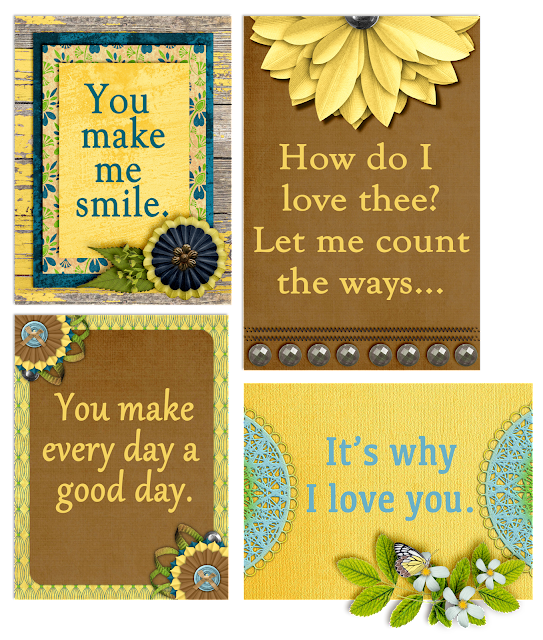 If you are looking for more cards, here are a few of ours. 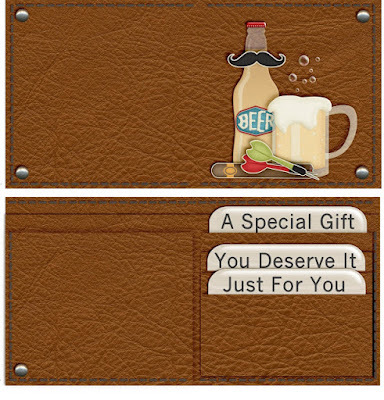 We've got this great apron template that you can use as a card. I even turned it into a mini album. Check the link out by clicking on the image. 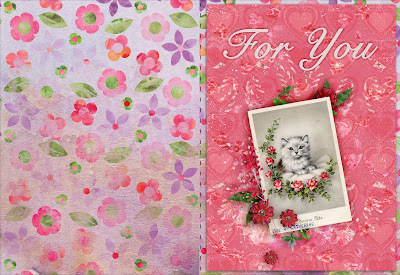 Here's a nice card good for any occasion. 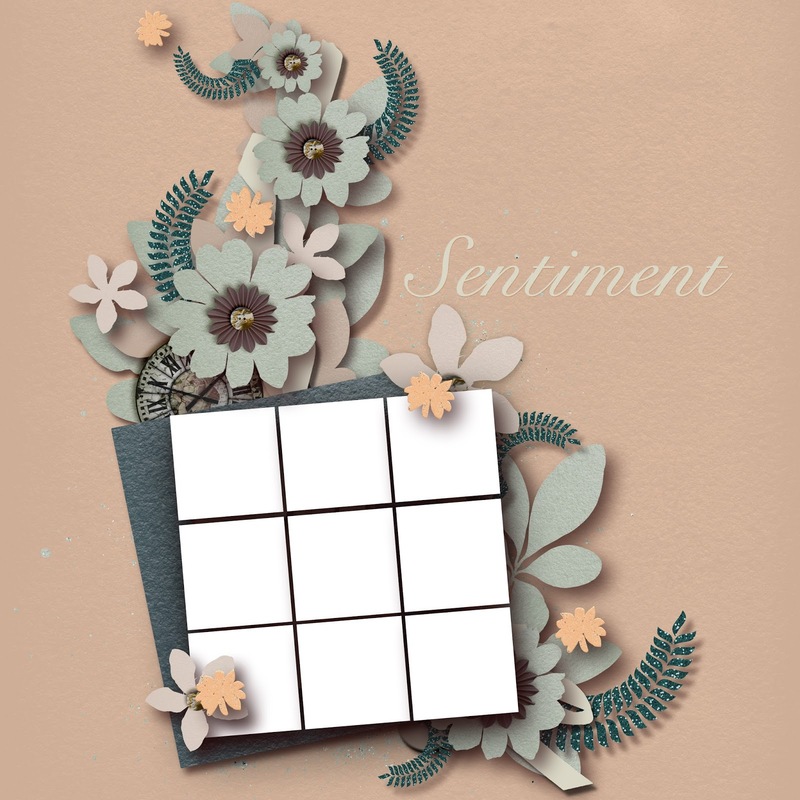 Here is one of my absolute favourite card templates. You can use it to give a monetary gift or a gift card. I've designed three totally different cards. Check out the template and the tutorial for these. 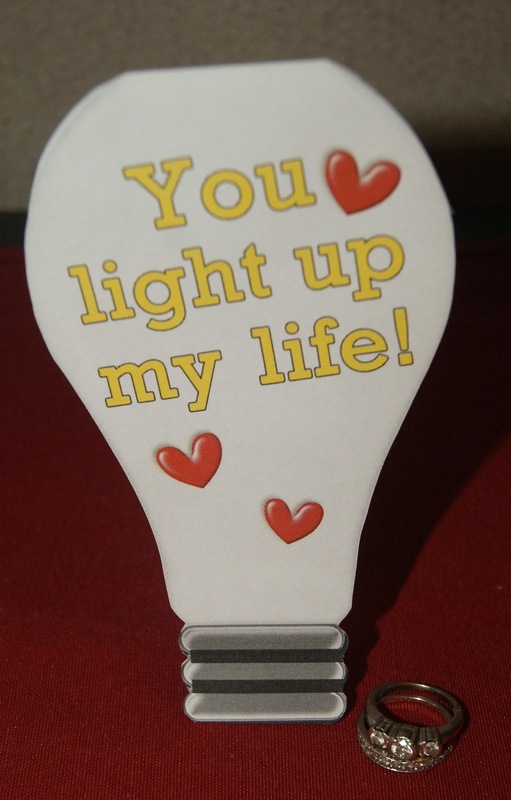 If you like our light bulb card, it's all yours! Go to the top image, right click and save to your downloads. Thanks for hanging out with The Cherry for Hybrid Saturday! 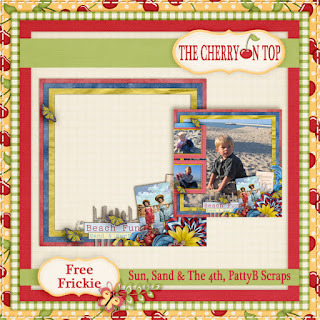 Welcome to The Cherry On Top's, Freebie Friday! We've got another lovely free frickie. A frickie is so many things. 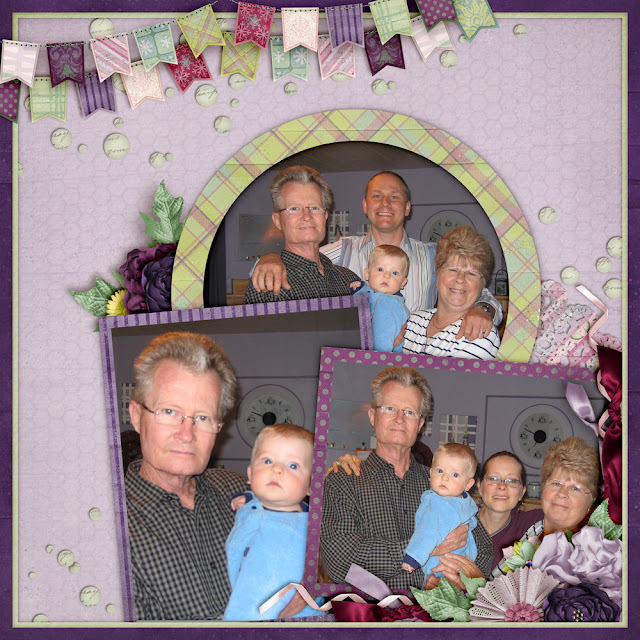 It's a quick page, an overlay or a frame and it's always free, here. I used my own Commercial Use stash to design this one. 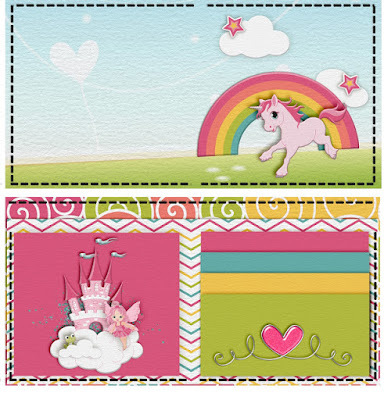 The designers are, Farrah's Design Scraps, Feli Designs, Zesty Designs, Designs By Brigit and Kim Broedelet. Let's see what you can do with a frickie. Blow that bad boy up and add your picture and you've scrapped! This is your free frickie from The Cherry On Top. 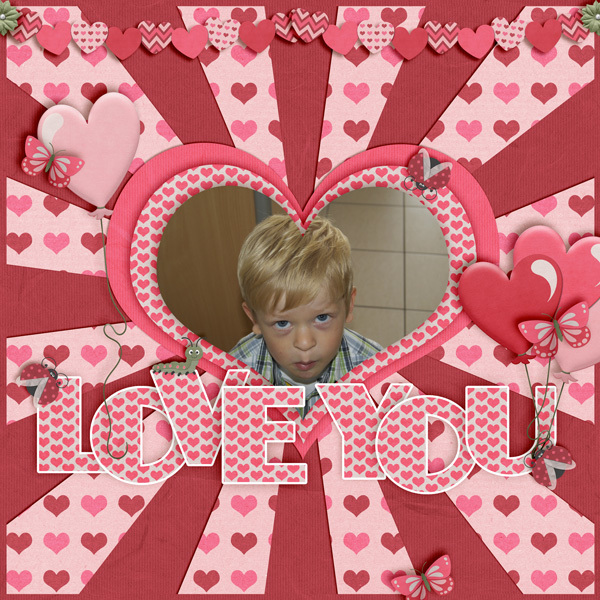 Right click to download, it's a png so the inside will be blank and you put your photo behind the frame. We've got a couple of other frickies on the blog. Here they are. Click on the image to grab them. They are free, too! 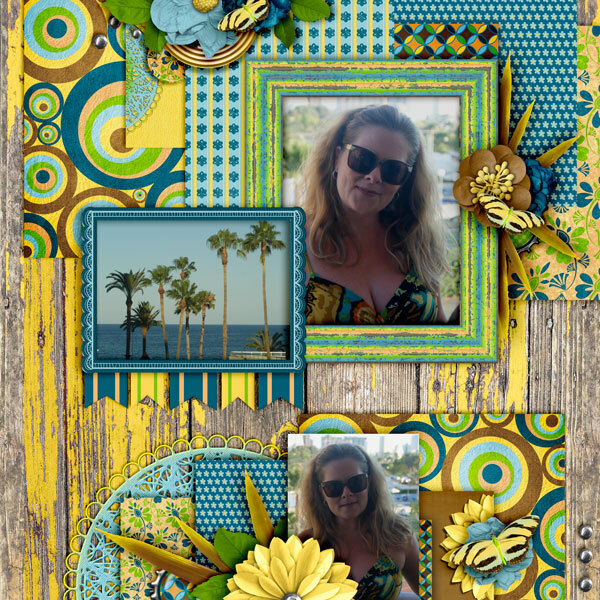 A fun summery frickie using Eqr Aveziur Designs. 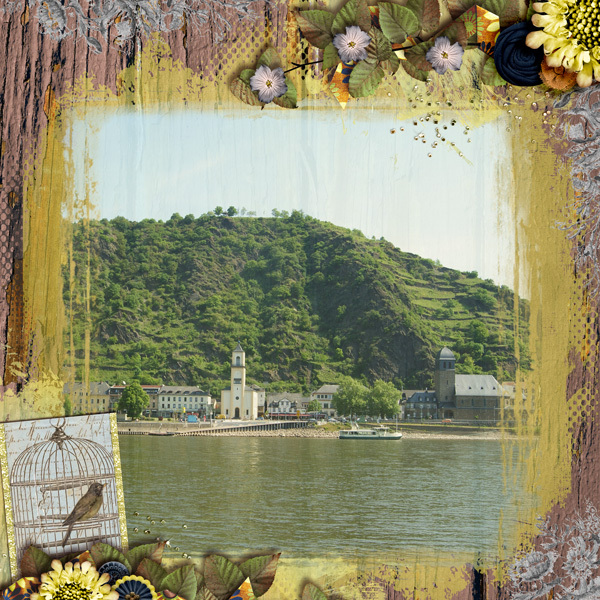 A lovely beauty edition from PattyB Scraps. You'll go to my Pinterest. Click on the image there. Changing it up a bit with Paty Greif Digital Designer. All of our goodies are for Personal Use ONLY. They are not to be resold or claimed as your own. Thanks so much for hang out with The Cherry. I feel like I'm slacking for not having posted in a few days. I've been working like crazy and I have a lot of fun projects on tap, too. I'm still hanging on some release dates, though. I thought I'd stick something in here that I know the fans really like and that's a free template! 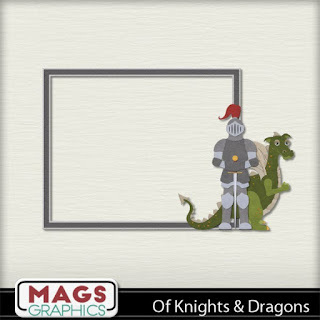 I designed this one for MagsGraphics Designs fans and they had a blast playing with it. Now, I'm offering it to our fans. Keep scrolling to get the free download. The image is all linked up. Here is a peek at a future free template. Isn't it great?! I sort of scrap lifted it from a design I saw on Pinterest. Ya gotta love Pinterest! This is also a future project for you in the shape of a hybrid. On Saturday, this blog will be ready for you. 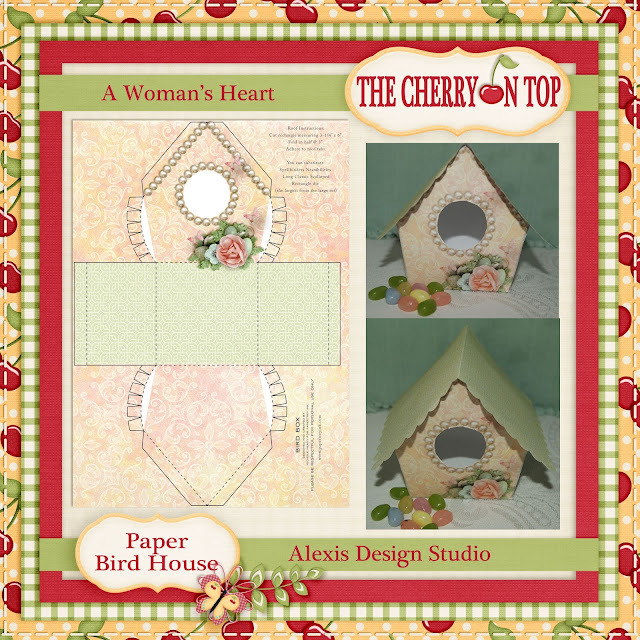 You'll get a full tutorial on how to construct this bird house and I'll have the link for the free template as well as instructions on how to get this kind of digital design for your house. We have tons of free stuff on our blog. Sit back and scroll through or check them all out in one handy place via our Pinterest board, The Cherry On Top's Freebies. Don't stop there if you love freebies. We've got several boards dedicated to free goodies and our Facebook Page offers many freebies, ever single day. We're back with another Monday edition focusing on Autism and sharing ways to help with different aspects across the spectrum. Let's take a quick look at what Pica is. Next week, we'll dive further in to this because it's a pretty scary disorder and you should really know your stuff to combat it. Pica is a developmental disability where inedible things are eaten or chewed on, to put it as simple as possible. Our youngest has this and in the beginning it was a nightmare. He would be caught chewing on sand, rocks, rusty metal, squishy plastic stuff, just about anything, really. He often choked and even ruined his teeth from constantly chewing on rocks and sand. You must be vigilant if pica is present, but we'll get into more detail next week. 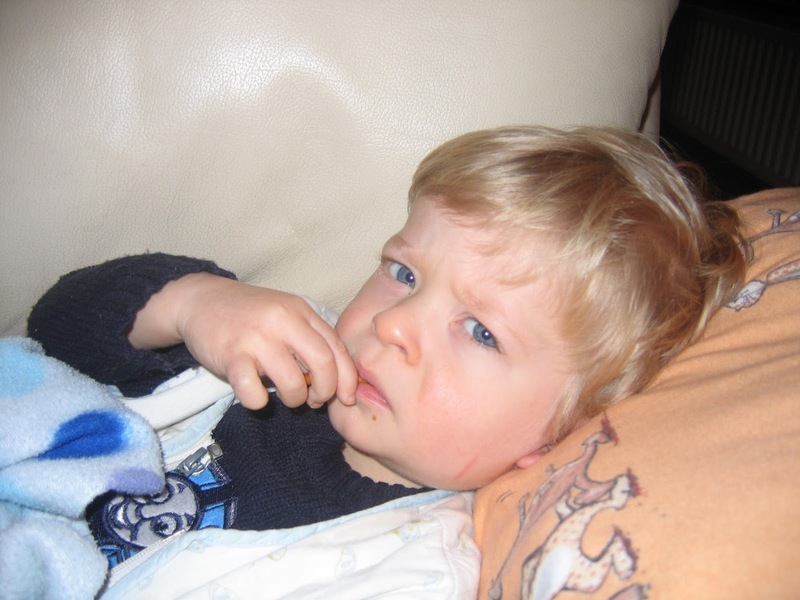 Let's look at the difference between oral defensiveness and oral hyposensitivity. 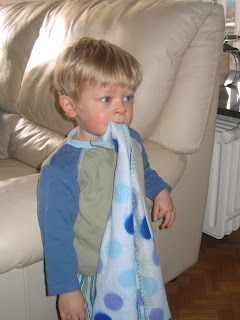 Jeffrey deals with just about all of these symptoms and as you can see has taken up with his blanket for pacification. Ironically, he never wanted to use a pacifier as a baby. I'm not sure if it is because he enjoyed breast feeding or not, but it is something I consider. Another huge problem with these kinds of disorders (if they are even considered a disorder) is diet. It is crucial that you do not allow your child to eat only junk. You must continually place various healthy foods in all different forms and present them in different ways. We've found just setting a huge array of goodies on the coffee table with the TV on, to be the most efficient and effective way to get both of our picky, sensory disordered kids to not only eat, but try new and different foods. It's even better when you leave the area and ignore them. I would also recommend, through our own strenuous research, to never pressure or shout in an eating situation when meal time is a struggle. It'll only get worse. Be creative! Allowing them to use their fingers is also a huge help. 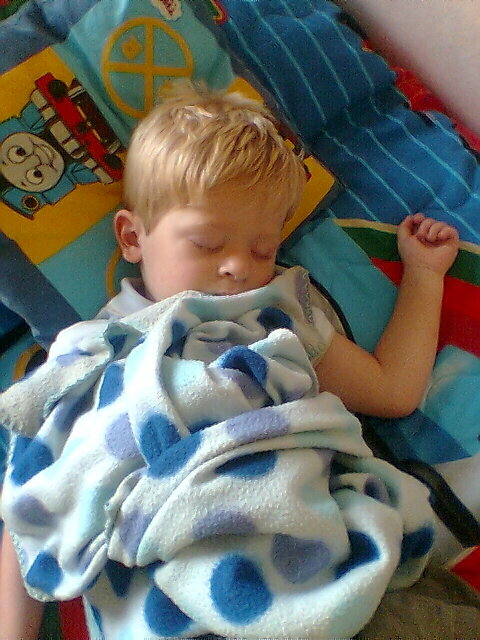 JJ has this blanket since the Autistic symptoms started appearing, which was around 1 1/2 to 2 years old. It has helped incredibly with Pica, jitters, focus, and anxiety. His blanket brings him so much joy and comfort. I don't care that he's 9 years old and carries it with him everywhere. I can't even begin to imagine how much more difficult his life would be without it. We often sneak the blanket away and put it on his bed or back in his drawer as a way to kind of ween him off or at least back a bit. However, there are times when he really needs it. We never ever make the blanket an issue. It is one of the most important things to him and really, what work is it for us? He's not aloud to take it to school unless he's having a terrible morning and asks. Here are a couple of examples of chewable jewellery. I'm definitely going buy these gems! I found them at the Therapy Shop. Click on the image to get them. My oldest obliterates his pens and pens. This might really help with that. 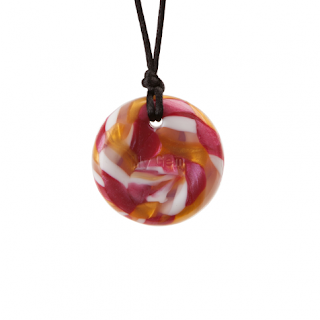 Here's another example in a necklace and pendant form. Of course, use caution if your child is a harsh biter. It is not candy. It is silicone. For more details click on the image. It's certainly fine to address obsessive oral behaviour. As in most of our Autism entries, we advice doing so with tact, respect and as calmly as possible. Diverting and distraction may take a lot of work, but they are really helpful ways to stop or lessen, oral fixations as well. Be sure to speak with caregivers and teachers about oral issues especially, Pica. Here are a couple of links if you want to look further into this. I'll be honest when I say that I can't find a lot of good sites out there. If you have, by all means, share the link in the comments. It's part of why I'm doing these entries. Taking bits of information from a variety of places and putting them as comprehensively as possible in one spot. Thanks so much for checking out The Cherry. We'll see you next week when we go further into Pica and then the week after, we'll look into other tools that will help in the classroom. Keeping up with hybrids every Saturday, we've got inspiration, freebies, new releases, templates and good ole Cherry craziness. 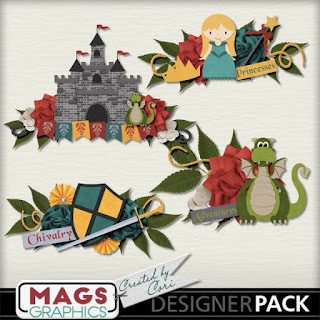 You'll wanna get those fingers tapping and that mouse a clicking with your next digital or traditional scrap project. 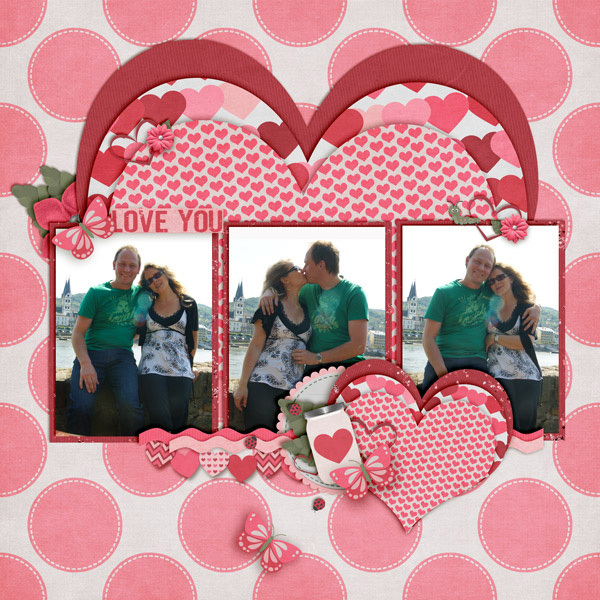 This kit is Aimee Harrison Designs' newest February 360 Collection found at the Digital Scrapbooking Studio. 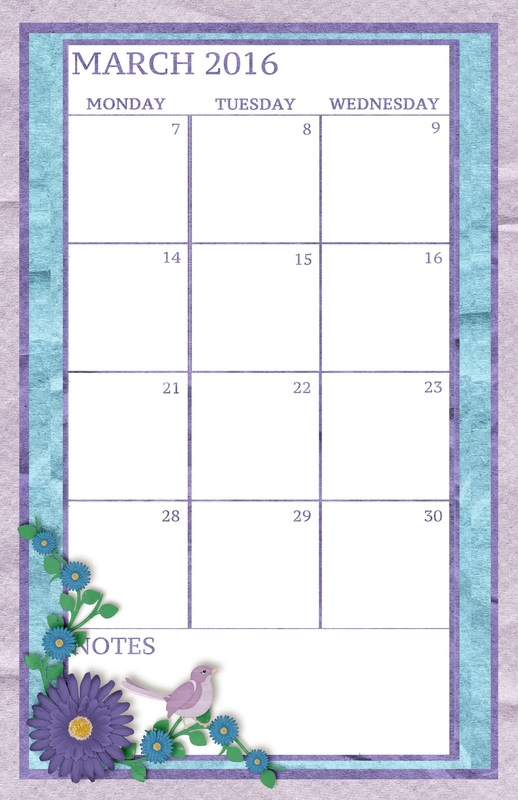 I used it for this layout as well as your February planner freebies. Keep scrolling to download them for free. This layout was not all my design. 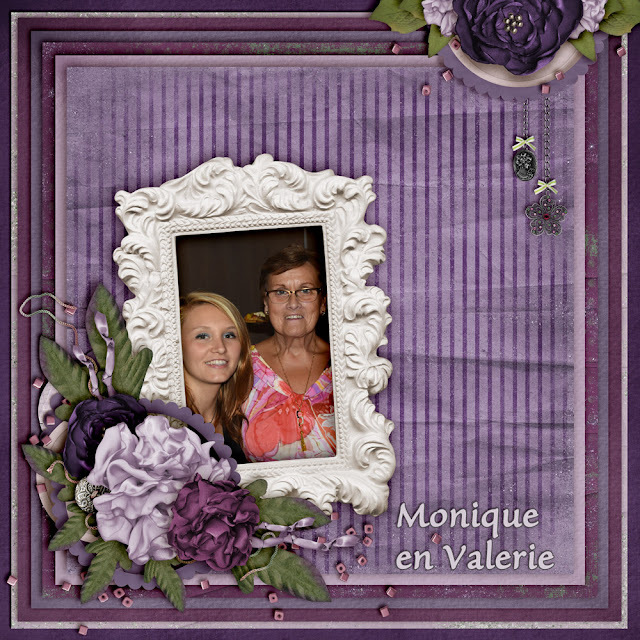 I used an absolutely gorgeous template from Heartstrings Scrap Art. 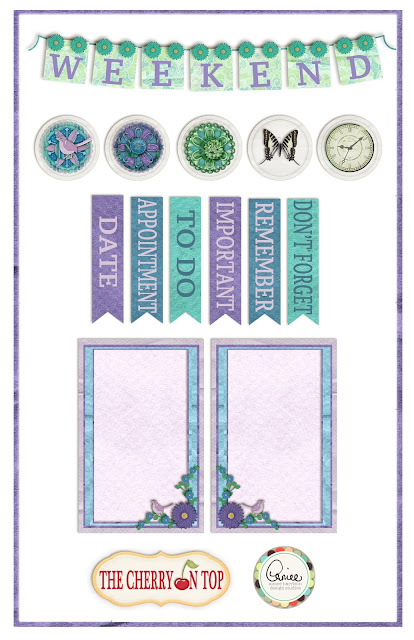 Bryony's templates are absolutely amazing. Keep reading to see some other templates and super inspiration to get your mojo go'n! February's goodies were really awesome. I designed them myself. Baby steps, right? March's goodies are my favourite so far! These colours totally speak to me. 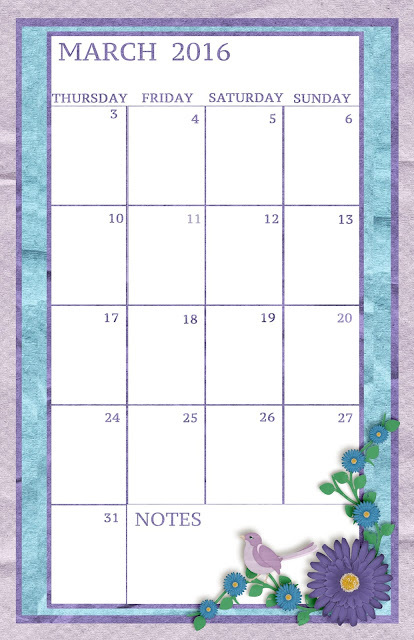 I'm born in February and maybe that's why I like purple so much? These pages can be downloaded by right clicking and downloading. Just remember they are for Personal Use ONLY and are not to be resold or claimed as your own. All of the goodies used in all three pages are from Aimee Harrison's 360 Collection for February. I had an absolute blast designing these inserts for your planner. What an amazing collection to scrap and play with. Right click and download. This is a closer look at what's in the collection. I'm all over that glitter! 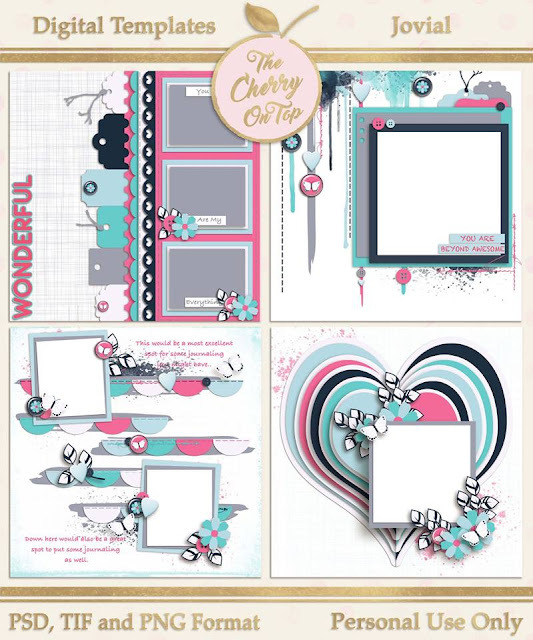 Here's a glimpse at some of Heartstrings Scrap Art templates. These are just fabulous! I thought I'd show you Aimee's January Collection. Is that purple?! Ha! 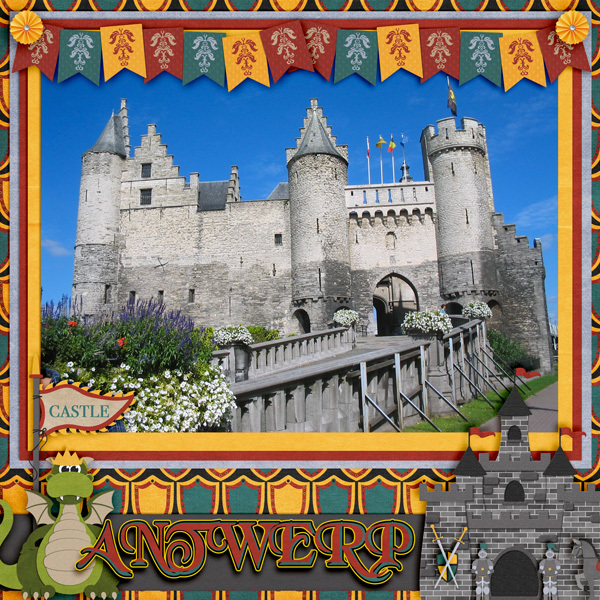 What super sweet photos of my parents rare visit to Belgium with my littlest pumpkin. Can ya see why I chose these stunning purple papers?! OMG! I'm in love! 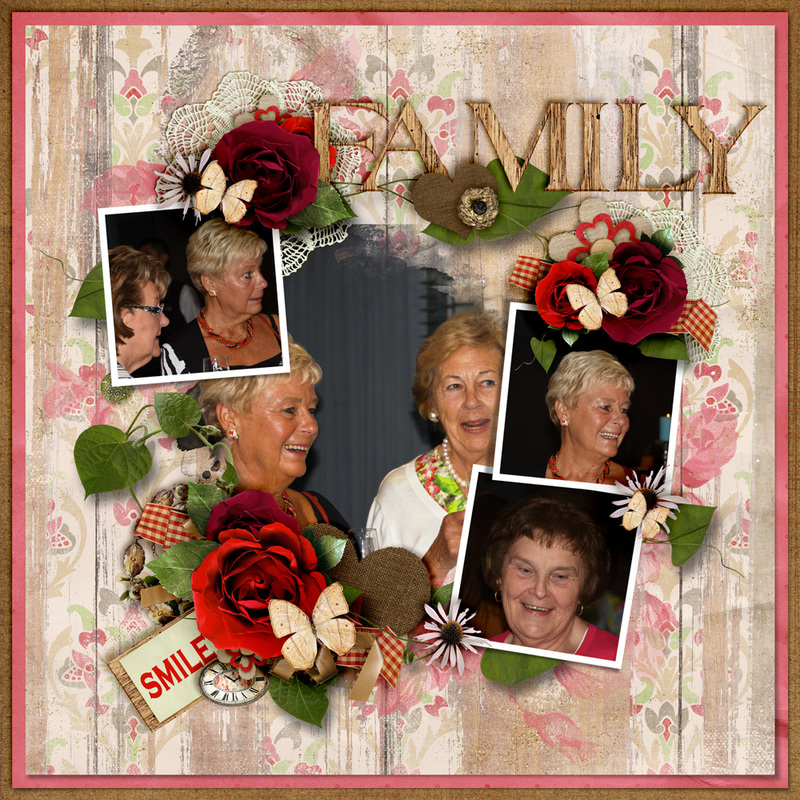 More fun layouts for my aunty to enjoy. Do you scrap for others or just yourself? I scrap for everyone! Hehehe...I'm sure you are not surprised at all. Take a look at January's Collection. That's it for us. We hope you like the freebies. Feel free to show us what you do any time you play with our goodies. We love when ya do that. Leave us some love if you download and if you don't think these freebies are enough, feel free to scroll through and get tons more. Also consider our Facebook Page and Pinterest, where we share free stuff every single day. Happy Friday, Scrappers and Creators! Everyday Friday and throughout the week, we offer free goodies. We've got you set with a couple of freebies and a chance to get even more through participation. There's a tutorial on how to design this word art and a link to download the font for free. 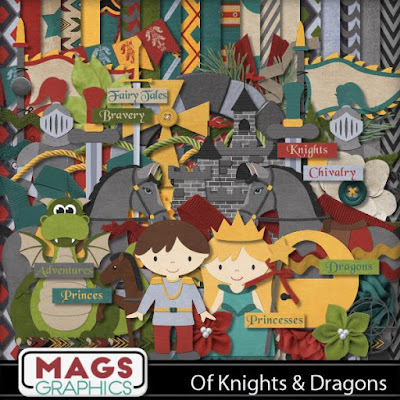 Of Knights and Dragons from MagsGraphic Designs is new in the shop and it's super for your knightly photos, wanna be knights, photos of castles or whatever you imagine. I used some of the coolest, key elements in my layout. 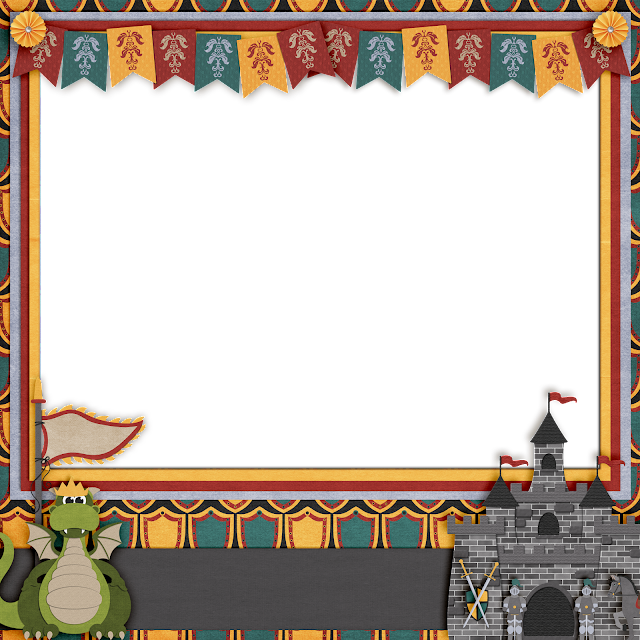 Dragon, castle crown, various swords...and that's just the beginning. This is the kit at a glance. 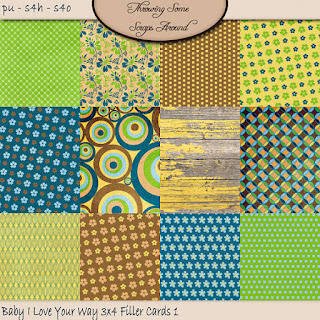 Zap over to Maggie's blog, see more layouts, download another freebie (There might be more than one.) and get a better look at the kit. Maggie is letting me give our readers this free quick page. 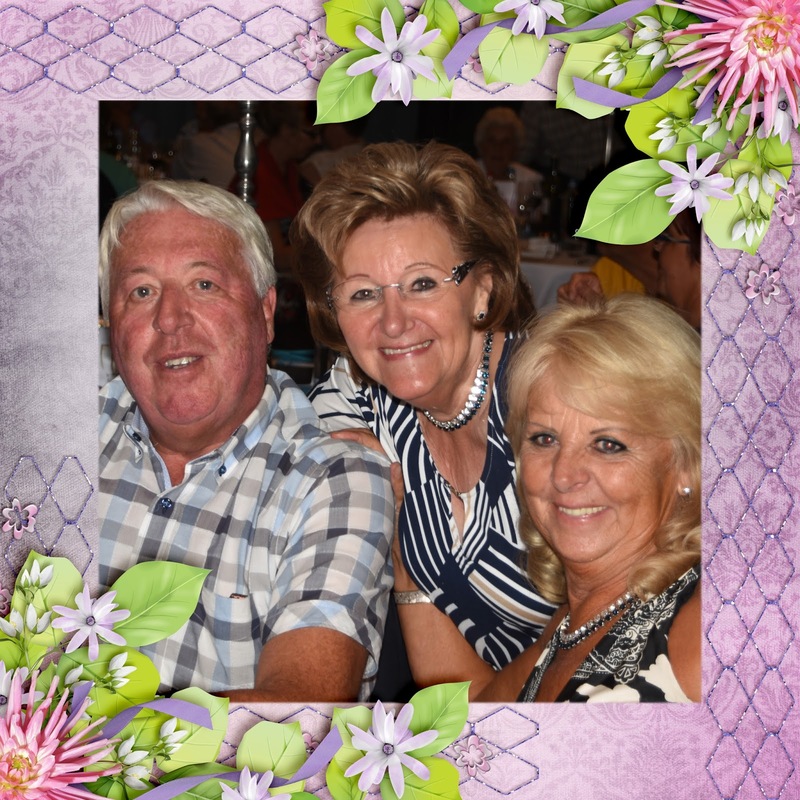 Put in your favourite picture and you've scrapped! Right click and save to your downloads. It's in png format. Find out how to get both of these freebies on Mag's blog. 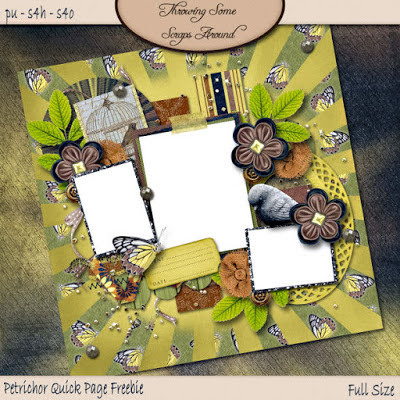 This is another new kit, Love Bug. You can snag a coordinating freebie on Maggie's blog, too! 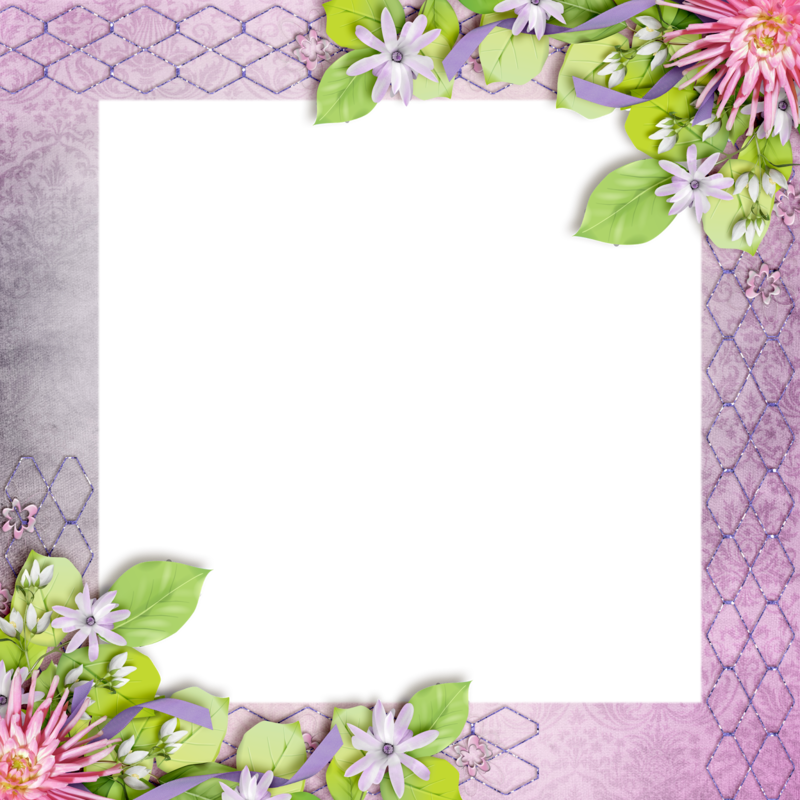 I've posted on MagsGraphic Designs Facebook Page, that if you show off something you've made with the kit or the freebie, I'll give you a nifty gifty in the form of this, free template. 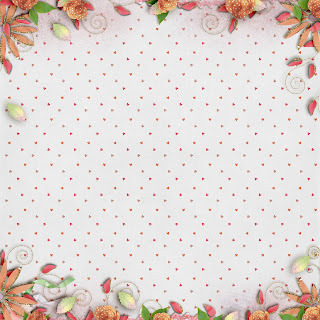 Click on this image to get to Maggie's Page and put your layout, cluster, word art, etc in the comments and I'll send you the links for this freebie. If you can't get enough of the free stuff check out our previous freebie and then some! We post dozens of freebies every single day via our Facebook Page, blog and Pinterest so make sure you are following! All of our goodies are for Personal Use Only and are not to be sold or claimed as your own. Thanks so much for Checking out The Cherry.